Lentil is the common name for a small, bushy annual plant, Lens culinaris, of the legume family Fabaceae, characterized by slender, branched stems and edible, lens-shaped seeds growing in short, flat pods. 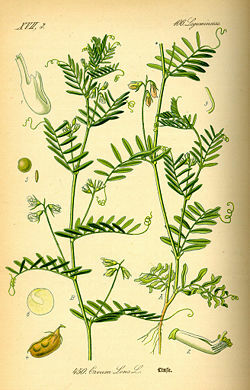 Lentil also refers to these round, flattened, protein-rich seeds, which are one of the earliest known cultivated foods. Daal and pulse are other names applied to this plant. The term sometimes is applied to members of all four species in the Lens genus and to their edible seeds. The lentil seed, so fundamental to the species' individual need for reproduction, likewise serves a purpose for the ecosystem and for humans, providing food for animals and a very nutritious food for people. Indeed, its high protein content has led to it being a meat substitute for many people, and it is a good source of various vitamins, minerals, and fiber. In addition, it provides a unique taste for people, allowing it to be used as a valued main dish or side dish, often included in soups, salads, and stews (Herbst 2001). As a legume, the lentil plant derives much of its strength and ability to adapt to diverse soil and climate conditions from a symbiotic relationship with a microorganism. The lentil plant provides shelter and carbohydrates to rhyzobia bacteria living in nodules on the lentil's roots. In return, the rhyzobia recover nitrogen from the air and pass it on to the lentil in the form of amino acids, which the plant can use for making proteins including key enzymes needed for photosynthesis. Lentils are members of the Fabaceae family, a group of flowering plants known as legumes. It is one of the largest plant families and includes beans, peas, peanuts, lupines, alfalfa, clover, acacia, and many others. All members of this family have five-petaled flowers in which the superior ovary (an ovary attached to the receptacle above the attachment of other floral parts) ripens to form a "pod," technically called a legume, whose two sides split apart, releasing the seeds that are attached to one or both seams. Legume plants are noteworthy for their ability to fix atmospheric nitrogen, an accomplishment attributable to a symbiotic relationship with certain bacteria known as rhizobia found in root nodules of these plants. Legume seed and foliage has a comparatively higher protein content than non-legume material, probably due to the additional nitrogen that legumes receive through nitrogen-fixation symbiosis. This high protein content makes them desirable crops in agriculture. The genus Lens of the family Fabaceae contains four species of small, erect or climbing herbs with pinnate leaves, small inconspicuous white flowers, and small flattened pods. While the term lentil sometimes is used to apply to the plants and edible seeds of all four of these species, most commonly, the term lentil refers to Lens culinaris and its seeds. Lens culinaris, sometimes referred to as Lens esculenta, is a bushy annual plant grown for its thin, lens-shaped seeds. It is about 15 inches tall and the seeds grow in pods, usually with two seeds in each, or sometimes three. Lentil seeds may be green, yellow, or orange-red (Bender and Bender 2005). Other colors may include brown and black. Red, white, and yellow lentils are decorticated; that is, they have their skins removed. The plant originated in the Near East, and has been part of the human diet since the aceramic Neolithic, being one of the first crops domesticated in the Near East. The lentil was known in Greece and Egypt before biblical times and there is reference in the Bible to lentils, with Esau having sold his birthright for lentils, although this also could have referred to other plants. Lentils are relatively tolerant to drought and are grown throughout the world. Lentils are very popular in Europe and a staple crop throughout the Middle East and India (Herbst 2001). They also are widely cultivated in North Africa, and are of growing popularity in North America. About half of the worldwide production of lentils is from India, most of which is consumed in the domestic market. Canada is the largest export producer of lentils in the world and Saskatchewan is the most important producing region in Canada. The Food and Agriculture Organization (FAO) estimates that world production of lentils totaled 3.2 million metric tons (MT) in 2003. Canada produced 520,000 MT and, according to the market analysis company STAT Communications, will likely export 400,000 MT during the 2003-04 marketing year, which runs from August to July. The FAO estimates world trade in lentils totaled 1.2 million MT in 2002, with Canada exporting 382,000 MT during the calendar year. The Palouse Region of Eastern Washington and the Idaho Panhandle, with its commercial center at Moscow, Idaho, constitutes the most important producing region in the United States (DPSES 2000). The three main varieties of lentils are the French or European lentil, the Egyptian or red lentil, and the yellow lentil (Herbst 2001). The French lentil has a grayish-brown seed coat and creamy yellow interior, and is sold with its seed coat on. The red lentil is smaller and rounder and sold without its reddish orange seed coat (Herbst 2001). All of these three are dried as soon as they are ripe, rather than used fresh (Herbst 2001). The seeds have a short cooking time (especially for small varieties with the husk removed, such as the common red lentil) and a distinctive earthy flavor. Lentils are used to prepare an inexpensive and nutritious soup all over Europe and North and South America, sometimes combined with some form of chicken or pork. They are frequently combined with rice, which has a similar cooking time. A lentil and rice dish is referred to in the Middle East as mujaddara or mejadra. Rice and lentils are also cooked together in khichdi, a popular Indian dish. Lentils are used throughout India, the Mediterranean regions, and the Middle East. In rare cases, the lentils are mixed with dairy cheese. A large percentage of Indians are vegetarian and lentils have long been part of the indigenous diet as a common source of protein. Usually, lentils are boiled to a stew-like consistency with vegetables and then seasoned with a mixture of spices to make many side dishes such as sambar, rasam, and dal, which are usually served over rice and roti. 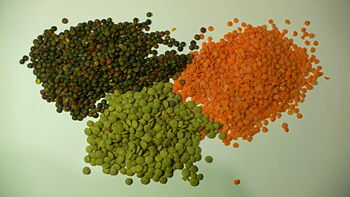 When lentils are prepared, they are first inspected for damaged lentils, stones, and other foreign matter. Then they are rinsed until the water runs through and comes out clear. Some prefer to soak the lentils for an extended time and discard the water. This removes substances that may cause indigestion. The lentils are then boiled in water or broth. They may be cooked on the stove top, or in a slow cooker. Pressure cookers are not recommended, since the small lentils may clog the pressure relief valve, and their quick cooking time means there is little benefit from pressure cooking. Cooked lentils often require thinning: adding more hot water or broth to the cooked legumes until the desired final consistency is reached. Stored airtight at room temperature, lentils will keep up to a year (Herbst 2001). Apart from a high level of proteins, lentils also contain a rich supply of copper and selenium, and are a good source of iron, vitamin B6, folate, and zinc(Bender and Bender 2005). In general, lentils are a good source of dietary fiber, but red (or pink) lentils contain a lower concentration of fiber than green lentils (11 percent rather than 31 percent) (ARS 2008). Lentils also have a fair amount of vitamin A, calcium, and phosphorus (Herbst 2001). In addition to providing slow-burning, complex carbohydrates, lentils are one of the best vegetable sources of iron. This makes them an important part of a vegetarian diet, and useful for preventing iron deficiency. Iron is particularly important for adolescents, and menstruating or pregnant women, whose requirements for it are increased. Health magazine has selected lentils as one of the five healthiest foods (Raymond 2006). Lentils are often mixed with grains, such as rice, which results in a complete protein dish. Lentils' contribution to heart health lies not just in their fiber, but in the significant amounts of folate and magnesium they supply. Folate helps lower levels of homocysteine, an amino acid that is an intermediate product in an important metabolic process called the methylation cycle. When folate and vitamin B6 are present, homocysteine is converted into cysteine or methionine, both of which are benign. When these B vitamins are not available, levels of homocysteine increase in the bloodstream—with potential for the homocysteine to damage artery walls and serve as a risk factor for heart disease. Lentils' magnesium is a calcium channel blocker. Sufficient magnesium aid veins and arteries to relax, which lessens resistance and improves the flow of blood, oxygen, and nutrients throughout the body. Studies show that a deficiency of magnesium is not only associated with heart attack but that immediately following a heart attack, lack of sufficient magnesium promotes free radical injury to the heart. In addition to its beneficial effects on the digestive system and the heart, soluble fiber helps stabilize blood sugar levels. Legumes such as lentils can help balance blood sugar levels while providing steady, slow-burning energy. Agricultural Research Service (ARS). 2008. USDA nutrient database. United States Department of Agriculture. Retrieved April 14, 2008. Bazzano, L. A., J. He, L. G. Ogden, C. M. Loria, and P. K. Whelton. 2003. Dietary fiber intake and reduced risk of coronary heart disease in US men and women: The National Health and Nutrition Examination Survey I Epidemiologic Follow-up Study. Arch Intern Med. 163(16): 1897-1904. Retrieved April 14, 2008. Department of Plant, Soil, and Entomological Science (DPSES). 2000. Crop profile for lentils in Idaho. Department of Plant, Soil and Entomological Science, University of Idaho. Retrieved April 14, 2008. Menotti, A., D. Kromhout, H. Blackburn, F. Fidanza, R. Buzina, and A. Nissinen. 1999. Food intake patterns and 25-year mortality from coronary heart disease: Cross-cultural correlations in the Seven Countries Study. European Journal of Epidemiology 15(6): 507-515. Retrieved April 14, 2008. Raymond, J. 2006. World's healthiest foods: Lentils (India). Health. Retrieved April 14, 2008. Yadav, S. S., et al. 2007. Lentil: An Ancient Crop for Modern Times. Springer Verlag. ISBN 9781402063121. This page was last modified on 20 August 2008, at 19:22.